"Weight stigma is one of the most misunderstood aspects of obesity." Weight stigma – a negative response to someone based on their weight – is the fourth most common form of social discrimination amongst adults – after age, gender and race. It is the only form of discrimination still widely deemed to be socially acceptable. Weight stigma is also one of the most misunderstood aspects of obesity. As such, it is often ignored. Increasing awareness about stigma and its effects could help to reduce the high levels that currently exist. Research has found that weight stigma and its emotional effects are significantly associated with all measures of disordered eating. Public messages that centre heavily around personal blame can lead individuals to develop maladaptive eating behaviours including restriction, bingeing and purging in an effort to become “healthy”. In fact, it is estimated that around 80-85% of people with eating disorders are not underweight. It can also take longer for people with obesity to receive treatment for disordered eating. Discrimination takes a significant toll on mental health and can lead to chronic stress. This in turn has been shown to have an impact on physical health in many serious ways. Stress can have a negative effect on blood sugar levels, blood fat levels, blood pressure, cardiovascular health, as well as insulin resistance and visceral fat levels. 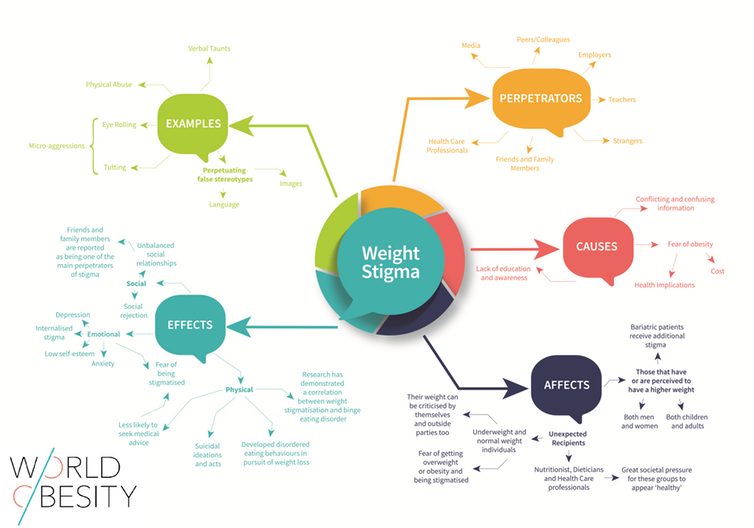 This diagram represents what researchers refer to as the Cyclic Obesity Weight Based Stigma Model. It demonstrates how weight stigma has been proven to cause stress and as a result, can induce particular eating behaviours which may lead to weight gain. 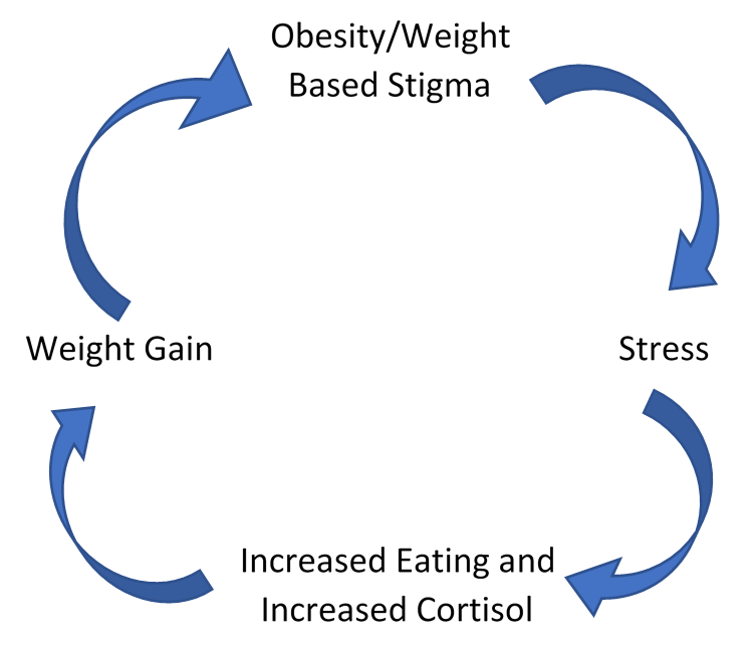 In addition to being cruel, the repetitive nature of this cycle means that weight stigma is a key contributing factor when it comes to the prevalence of obesity. Negative assumptions and cruel comments from friends and family members have been reported as one of the most common experiences of weight stigma. Research has found that experienced stigma from family and friends is directly linked to coping strategies such as increased eating and binge eating. Widespread weight bias and stigma can lead individuals to believe that the negative stereotypes attributed towards them are true – and that they deserve the stigmatisation they are so frequently subject to. This self-deprecating reaction has even been shown to remain in individuals that have lost weight. Internalised bias has been linked to an increased likelihood of suicidal thoughts and acts. Obesity is a global issue and one which the majority of the population are acutely aware of. The central messages within the current narrative surrounding obesity are that it is a growing problem which is detrimental to health and requires action and intervention. While there is validity to each aspect of this central message, there is one crucial piece of the puzzle missing. The complexities of weight stigma. Weight stigma is a serious issue and there are many aspects of it that are currently absent from the conversations surrounding obesity. The role that weight stigma plays is a fundamental factor that needs to be considered and addressed. The results of stigma can be catastrophic, and greater sensitivity towards it needs to be exhibited. The kind of resources provided by organisations like the World Obesity Federation can help government officials, media professionals, health care providers and members of the public learn more about how to do this. If we are to improve the health of our societies, weight stigma can no longer be sidelined in actions, interventions and policies surrounding obesity. Raising awareness of this issue is the first step towards reducing its prevalence – and preventing weight stigma from continuing to be the most socially acceptable form of discrimination.